The MKV Delux Nexus System. 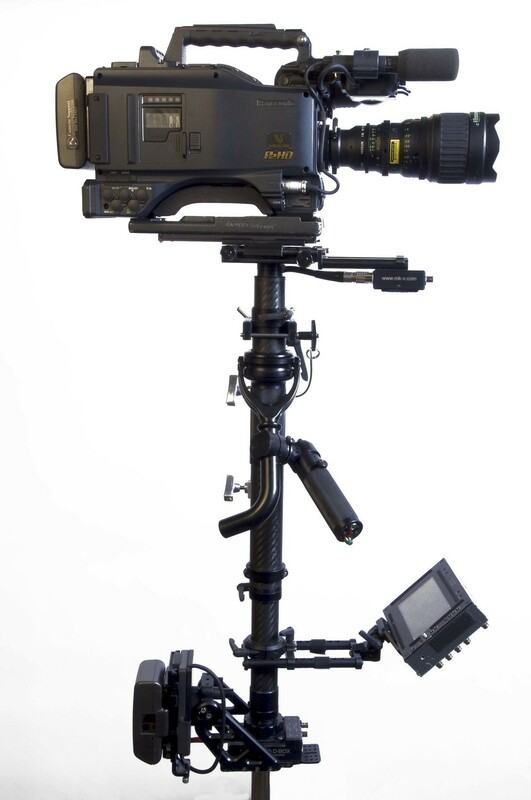 Designed for HD and light-weight film cameras, the MKV is equipped with a Panasonic 7” HD monitor and Stanton Zoom and Focus controller. This system is compatible with video cameras when coupled with a wireless zoom focus system it can support film style cameras such as the Red and Alexa. Equipped with the “super post” it makes shooting in low modes easy and fast. The battery bracket allows for mobility and multiple positions for mounting batteries and other accessories.The sled is designed to carry cameras ranging in weight from 5 to 35 pounds. Cameras weighing under 20 pounds require a special adapter (included). Zoom is designed for video-style lenses. The Shadow V Steadicam is designed to be user friendly, versatile and tool free so the operator can easily configure the sled length and balance for each shot. Dual monitor mounts, frame-line generator, on screen artificial horizon and a dual battery mount are just a few features of this model. The carbon fiber telescoping posts extend the sled from 25-38 inches. The G70x arm lifts from 12-70 LBS. Kit includes the Stanton zoom and focus controller.